Window Treatment is one of the most important aspects of making a house or an apartment feel like a home. Here at Interior Decorating by E & J we will create unique custom made window treatment for your interiors. Regardless of your needs, we can create and install any type of window coverings in any fabric, pattern, color, shape, style or length. Draperies are one of our specialties here at E & J and our mission is to provide you the best fit to your personal style from traditional to modern. Drapery: Pinch pleated, French pleated, Pencil pleated, Ripplefold, Goblet pleated, Flat rod pocket and more. Shades: Roman shades, Flat Roman shades, Pleated Roman shades, Ballon Roman shades. Roller Shades: Black out or Solar roller shades. 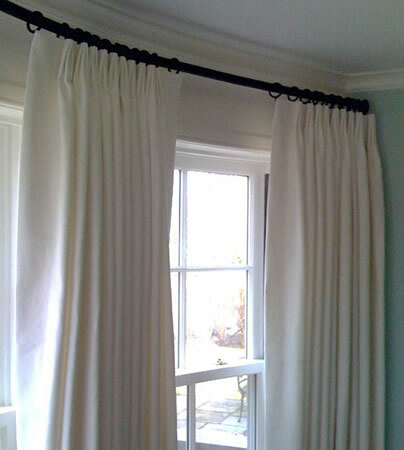 Valances: Box pleated, Gathered, Cornice, French Pleated and more. Swags & Jabots: Single swag, Double swag, Cascade, With Rosettes, Trim detail, Tie Back and more. Bedding: Bed Spreads, Duvets, Canopy, Coverletts & Dust Ruffles. Pillows: Shams, Bolsters, Decorative pillows.